In the far south-east of Europe surrounded by the clear waters of the Aegean Sea lies the Greek island of Skiathos. It is the westernmost island of the Northern Sporades and is situated not far from the Greek mainland. Yet the island itself was beautifully remote and has all the charm of a location which hasn’t yet been swamped by mass tourism. Those who choose to go there on holiday do so to sample the local culture and ways of life which the islanders themselves are so fiercely proud of. Arriving in mid-June, we had the dual advantages of the island not yet being too crowded, and the delightfully warm, but not blisteringly hot weather. The best views of the island itself and the surrounding sea are found up in the mountains, which is where our villa was situated, and the panorama we got to enjoy from our balcony more than made up for the steep, uphill walk that was required to get there. The town of Skiathos is quaint and charming with winding cobbled streets leading to shops selling local hand-made wares from pottery to jewellery, all so delicate and intricate that it was obvious how much care had been put into crafting them. As with the shops, the restaurants and cafés are, more often than not, run by families. The food is freshly cooked and (in the case of seafood) often freshly caught. In the evenings, restaurants often featured traditional live Greek music and all the diners were encouraged to get involved. Much of the inland is covered with large, shady pine trees which are home to some of the now disused monasteries. Their breath-taking, elegant designs, albeit faded, are nevertheless a wonder to observe. Far from the cool calm of the forests, sandy beaches stretch along the coastline. Perhaps the most beautiful was Lalaria Beach with its dramatic rock formations and shores covered with sun-baked pebbles. However tranquil the turquoise sea may seem from the surface, it becomes obvious that that is far from the case while snorkelling or scuba diving. Schools of fish, multi-coloured corals and translucent jellyfish are only some of the inhabitants of the Aegean Sea. Once back on board the boat I could relax in the hammock, quickly drying off under the heat of the midday sun. 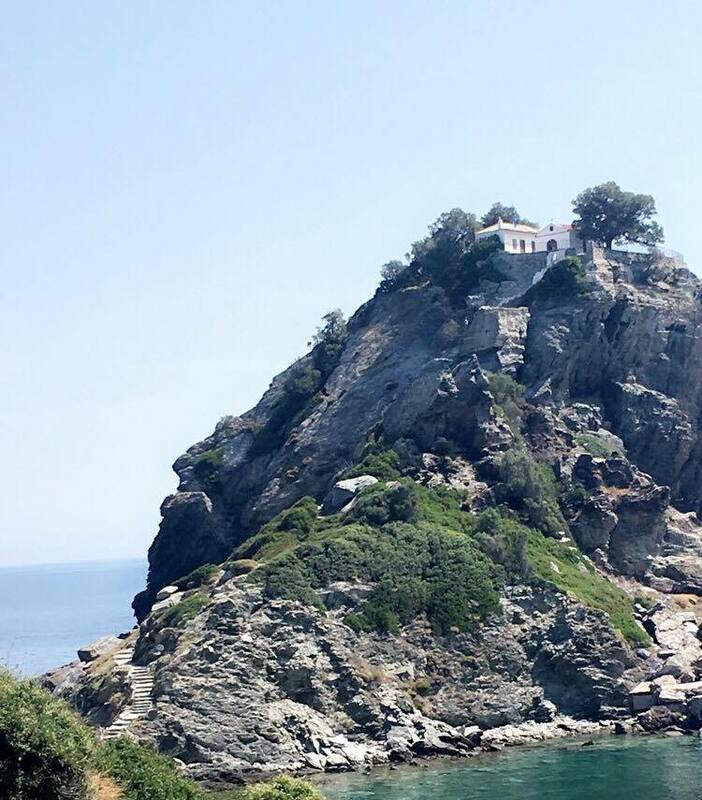 The captain’s next stop was the neighbouring island of Skopelos. Although just as beautiful as Skiathos, it is more popular with tourists because it was the filming location for much of the 2008 film, Mamma Mia! The chapel in which the wedding scene takes place is open to the public, so naturally we thought it would be a great idea to visit. How Meryl Streep managed to run up all those steps in stilettos whilst singing ‘The Winner Takes It All’, we’ll never know. We eventually clambered to the top, though, and had to admit that the climb was worth it for the beautiful view we found there.